August is peach season in Ontario! Eating seasonally & locally means the food is picked at peak freshness and gets to you quicker. The result is maximal nutrition for you. One peach has about 10% of your fibre for the day, 15% of your Vitamin C needs, and is loaded with antioxidants to protect the body against free radical damage. 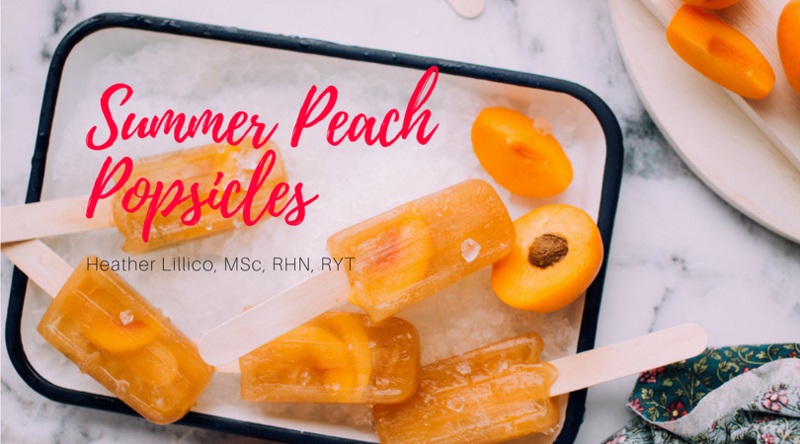 When you want a sweet treat that’s full of flavor, reach for these popsicles! These are great for Summer BBQ’s or late nights on the deck. Wash the peaches and leave the peel on. Chop peaches in half to remove the pits, then chop into smaller pieces. Throw the peach pieces in a food processor or blender, along with the honey and lemon juice. Blend until smooth. Pour the liquid into popsicle molds and place the sticks in. Pop into the freezer until solid (about 6 hours). 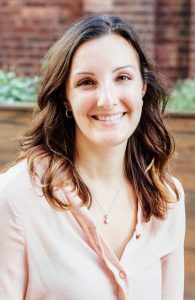 Heather is a Registered Holistic Nutritionist trained by the Canadian School of Natural Nutrition. She also has a Masters of Science in Public Health and a Bachelor’s of Science in Kinesiology both from the University of Waterloo. Heather specializes in personalized nutrition using live, natural, and whole foods and looks at many factors surrounding food choices such as stress, sleep, mood, and lifestyle. She has a strong background in mental health and is passionate about promoting its connection to nutrition. Heather sees clients who are overworked, overstressed, and overtired and empowers them to bring their body back into balance. She also specializes in plant-based diets, being vegan herself since 2013. In her spare time, you can find her scouring dog parks for animals to pet, or searching for the city’s best smoothie!